Tim Campbell (Chairman at the Urban Age Intitute). Xavier Wartelle, General Manager at PRIME, started by presenting PRIME’s mission and its focus on smart cities. He mentioned the association between the cities of Paris and San Francisco. They have mutually chosen to support two major R&D centers, Inria (The French National Institute for Research in Computer Science and Control) and CITRIS (Center for Information Technology Research in the Interest of Society, UC Berkeley) to carry out joint research on smart cities. The main goal of the partnerships will ultimately be the creation of a platform to improve and facilitate access to data, research exchange and simulations between the clusters and finally, boost the discovery of solutions. The panelists highlighted actions regarding climate change, the potential natural disasters and also presented an overview of each cities’ situations. Making observations on cities presents us with the details of what’s really going on in these urban communities. -Tim Campbell, Chairman at the Urban Age Intitute. The Carbon Disclosure Project (CDP) is an independent, not-for-profit organization that works to reduce greenhouse gas emissions and drive sustainable water use by business and cities. This organization has accumulated data from 110 cities in 2013 and reveals how climate change is impacting cities (More information on their website). By presenting the report, Claire Bonham-Carter gave us an overview of the worldwide situation regarding resiliency. Most of these 110 cities have already identified the biggest threats they will face in the future, including climate change among others criteria. 78 of them have a resilient plan running. 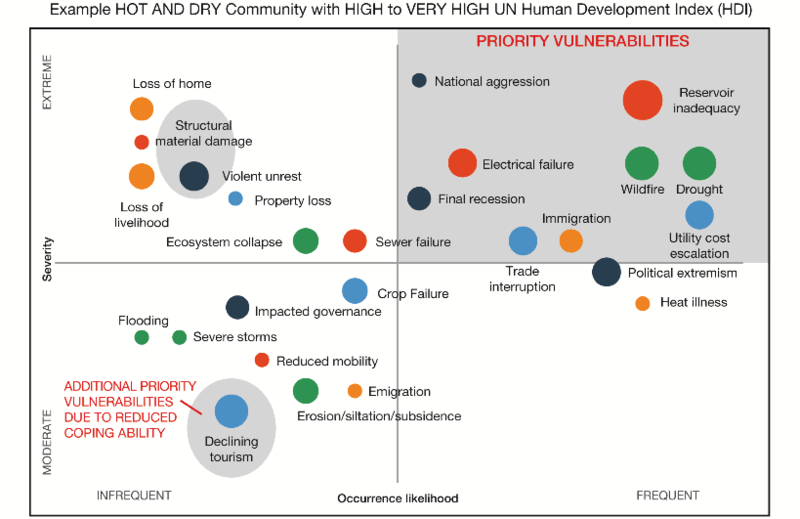 As a short conclusion of this report, rising temperatures, floods, storms, and frequency augmentation remain the top concerns for cities. However, when it comes to sea level increase cities don’t seem to have an adequate solution and many are still researching their options (see the example of San Francisco). Part of the good news is the appearance of economic interests around smart cities revolution as we can now recognize private energy or utilities companies knocking on the cities’ doors to be part of their groundbreaking projects. Investment in building a safe environment for communities is actually a safe investment for local governements. Big corporates like Facebook, Apple or Google place a huge role in the city’s urban planning. They have been sensitive to the concept of resiliency from the very beginning and have put it into play when launching products…In this way, resiliency is a fuel for activity and an opportunity for local authorities to attract investments!